So this morning I met Joe Warwick at Council Rock Rock at 6:00am for a quick 6 mile run with some pick-ups. It was a cool morning but a great one for running. 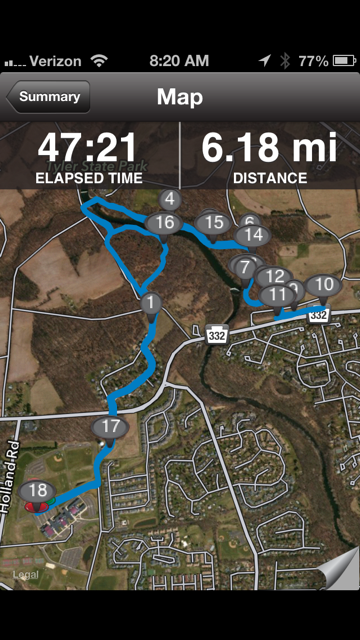 We ran for about 2 miles from CRS to Tyler State Park and then started the 1 minute pickups. The goal was to run them at 5K pace with 1 minute recovery. The pace felt quick but not hard and the legs seemed to have some zip today. All a good sign. During the run Joe and I discussed our plans for Broad Street both in terms of racing and the logistics. Looks like we will be staying downtown and taking an early subway to the start. Tomorrow is an off day of running and then some easy miles on Saturday and it will be go time. Breaking 58 minutes is the goal. This will not be easy but Joe and Bill are confident that we can all run sub 58 so I am actually beginning to feel confident as well. It will be having the foot on the accelerator the entire time for sure! Sub 58 would definitely be a good sign for a strong half marathon at the Maccabiah games! I will need to be able to run that kind of time to have any shot at 1:16 in Israel.